The most vulnerable part of structures to penetration by both water and subterranean termites is the concrete slab resting on the soil. Concrete slabs have joints, penetrations, and cracks. Since termites are proven to penetrate openings larger than 0.018″, joints, cracks, and penetrations can be water or termite entry points. Since you can’t predict where cracks will appear in the concrete slab, the entire horizontal surface of the lowest level slab must be protected. 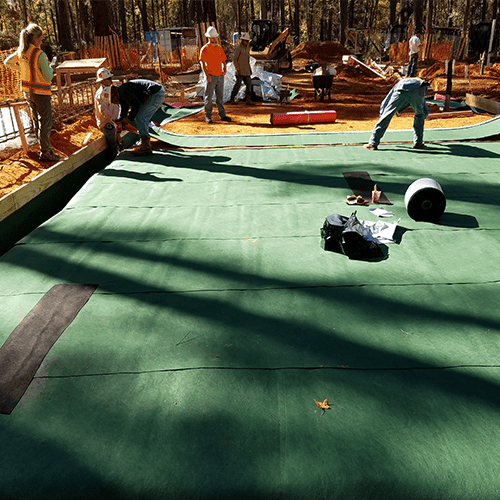 Full underslab waterproofing is being used across the U.S., and Polyguard has produced millions of square feet of underslab waterproofing. Now, with TERM Barrier Sealant incorporated into the underslab waterproofing, termite protection comes at little or no extra cost. Waterproofing of underground foundation walls has become widespread since 1970, when Polyguard began manufacturing waterproofing membranes. Concrete foundation walls are explored by subterranean termites, who search for openings in a crack, penetration, or seam. Subterranean termites find their way blocked if TERM Waterproofing|Termite Barrier has been installed. Since TERM is part of the foundation waterproofing. the cost of adding this termite protection is minimal. Construction of Insulated Concrete Form (ICF) foundations has become a popular method of sustainable construction. Unfortunately, ICF foundations are also popular with subterranean termites. ICF gives termites everything they look for in a nest. Here they find warmth, protection from predators, access to food (in the structure), and access to water (in the ground outside the wall). 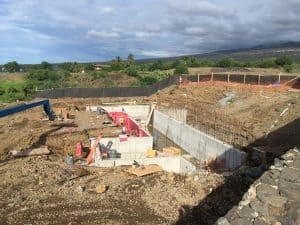 The fact that termites nest in ICF foundation walls has caused many building code officials in the U.S. to require physical termite barrier protection for below-grade ICF waterproofing. 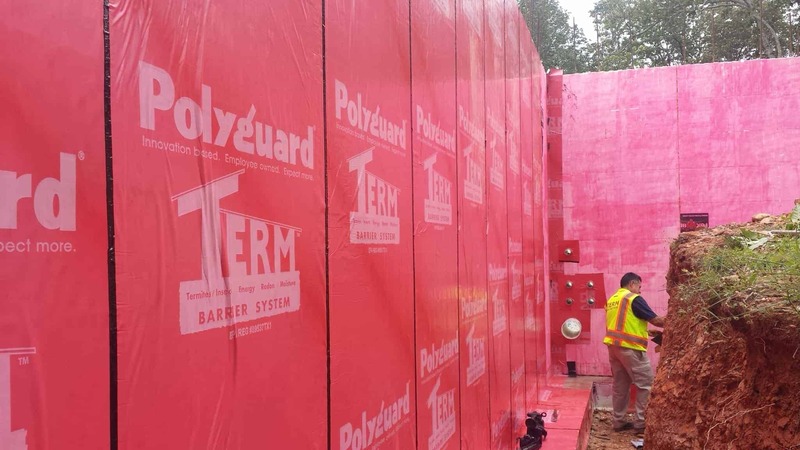 Polyguard TERM Waterproofing|Termite Barrier provides that barrier – built into the waterproofing. TERM is the only waterproofing physical termite barrier with 18 years of testing, and an evaluation report by the ICC (International Code Council). TERM Sill Moisture|Termite Barrier is not simply a physical termite barrier. It keeps moisture in the concrete slab from reaching the interior. And it acts as an energy seal, in conjunction with TERM Flashing|Moisture Termite Barrier. Many structures now treat framing with sodium borate, installing during construction. TERM Sill Moisture|Termite Barrier supplements borate treatments, protecting the vulnerable underside of the wood sill. 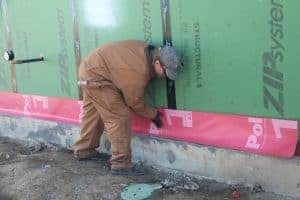 TERM Flashing Moisture|Termite Barrier is another example of how protection which you already incorporate into construction can be upgraded with a new aspect of sustainability at low or no additional cost. TERM Flashing Moisture|Termite Barrier prevents moisture from entering underneath the base of exterior sheathing and protects energy leaks as well. Plus, the “peel and stick” TERM Flashing Moisture|Termite Barrier incorporates a non-chemical termite barrier. TERM Flashing Moisture|Termite Barrier is another example of how protection which you already incorporate into construction can be upgraded with a new aspect of sustainability at low or no cost. TERM Moisture|Air|Termite Barrier is a “peel and stick” non-chemical barrier membrane applied over joints of sheathing, and as a window flashing where both waterproofing and termite exclusion is desired. Sheathing joints are potential entry points for termites which have accessed the exterior wall via the exterior foundation wall, and climbing over the TERM Moisture|Air|Termite Barrier installed at the base of exterior sheathing. Windows are a frequent entry point of both climbing and swarming termites. Plumbing penetrations through ground level concrete slab are a major termite entry point. 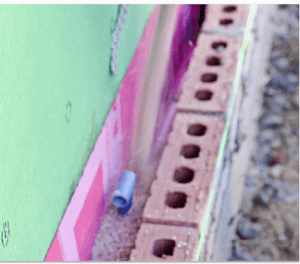 But subterranean termites can enter structures between the concrete and the penetration because they only need a 1/50th (0.02″) opening, which is too small to see. Also, the insulation around the pipe can actually serve as a termite nesting area. The blue and red plastic sleeves in the photo are used as a protective separator between the penetration and the concrete. They protect metal penetrations from the highly corrosive concrete. But few know that those sleeves are used by termites as an entry tunnel. TERM Water|Termite|Sealant Barrier was used here to seal out termites when they reach the top of the slab penetration. Treating penetrations is inexpensive, easy, and blocks a common termite entry point. Termite shields are a long-established method of termite control. Properly installed, they can force the termites to build “mud tubes” and enter the structure from outside. Visual signs of mud tubes make it possible for a trained pest management professional to see that the structure needs termite treatment. Termites are certainly blocked by the metal termite shield, but if gaps are left at seams and penetrations, the 0.020″ termite can get through. This is why gaps in termite shields should be sealed with TERM Sealant. TERM Water|Termite|Sealant is the only barrier proven by 18 years of university testing, and documented with an International Code Council evaluation report ESR-3632. Slab blockouts are often used with concrete slab construction. An actual hole is left in the slab under bathtubs or mop sinks. In the event of overflow, the water will drain away. This opening is another frequent termite entry point. A 4″ thick layer of TERM Particle Barrier applied to clean concrete sides of the opening (see upper photo) will stop termites. Since numerous pests enter structures through bath traps, TERM All Pest Bath Trap Barrier (see lower photo) will stop just about every pest – not just termites, but fire ants, moles and other intruders. 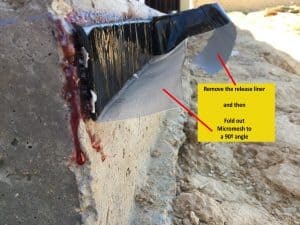 TERM Particle Barrier Cavity Fill application is an adaptation of the Australian method for protecting the masonry cavity from invasive termites. (Australia is home to several of the most invasive termite species, two of which are more destructive than Coptermes formosanus, the worst species found in North America). The Australian design for this application has been adjusted to fit American masonry cavity construction. Both design methods block entry of termites attempting to enter at the masonry weep openings. TERM Tile Underlayment|Termite Barrier is another example of how we have added a termite barrier property to a widely used flooring underlayment. In the photo TERM TIle Underlayment|Termite Barrier is ready to have a ceramic tile floor installed on top. TERM Tile Underlayment|Termite Barrier has other valuable properties. It acts as an “anti-fracture membrane” and helps prevent tile from cracking when the floor underneath it cracks. It has sound deadening, moisture barrier, and thermal break properties which help the room be quiet, dry and warm. TERM Wood Floor Underlayment|Termite Barrier for concrete is a waterproofing membrane, with termite barrier, sound deadening, and thermal break properties which help the room be quiet, dry and warm. 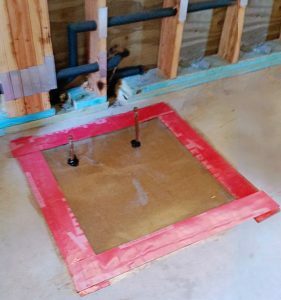 TERM Isolation Joint|Water|Termite Barrier is a “peel and stick” termite barrier composite used for sealing isolation joints (cold joints) before pour of a new exterior slab butting against an interior slab. TERM Isolation Joint Barrier consists of a laminated elastomeric membrane which has a TERM Sealant Barrier adhesive on both sides. Embedded within the TERM Isolation Joint|Termite Barrier is a stainless-steel screen, with aperture opening of 0.018″ (0.465 mm) which is the size known to block termites.